Since its creation in the mid-1990s, the National Land Cover Database has acted as the census of land cover data. Free to use and available online, the newest edition of the database was released in early April 2014, and will continue to help professionals from a wide array of industries monitor land cover changes. The NLCD is a product born out of necessity, Homer said. In the ‘90s, less-ubiquitous satellite coverage limited the availability and accessibility of satellite data. The data was under a commercial program and cost several thousand dollars for every image. The U.S. Environmental Protection Agency, National Oceanic and Atmospheric Administration and the USGS spearheaded the effort to create a consistent, affordable national land cover data layer. Their work came to fruition — with the help of several other agencies — in the 2001 NLCD. “Land cover is the vegetation or material that actually covers the surface of the earth,” Homer said. This includes forests, urban coverage, bodies of water, and so on. Homer stressed the difference between land cover and land use: a city park, for instance, would be designated as trees and grass in a land cover layer, rather than urban coverage. Atmospheric, climate and weather models incorporate land cover data in their forecast maps. 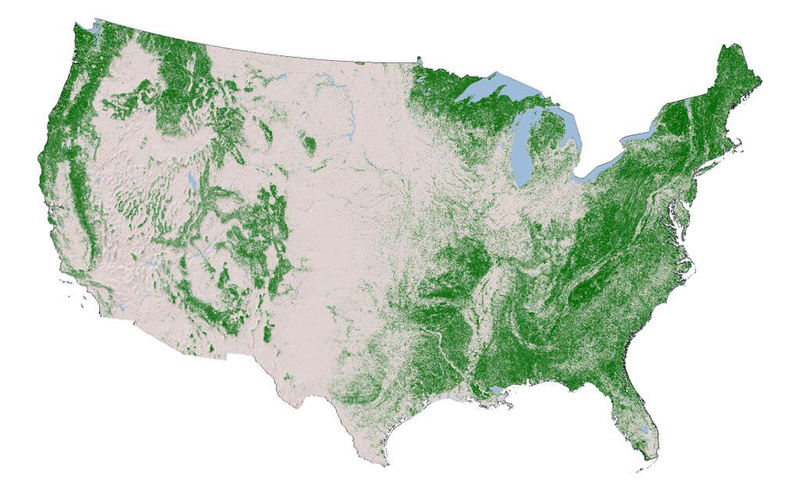 Forest and range managers can track changes in topography and canopy cover using land cover data. And up to 60 percent of all analysis under the Clean Water Act is performed with the help of the NLCD. About 30,000 files are downloaded from the NLCD annually, Homer said. “If you’re a user and… the amount and distribution of land coverage is important, then you need to know where and when it’s changing,” Homer said. The current NLCD “epoch” represents a period from 2006 to 2011. The NLCD is updated every five years, and although faster update times are an eventual goal for the database, Homer said a couple obstacles prevent immediate improvement. “We need a better satellite data stream before we can increase the frequency a whole lot,” Homer said. Cloud coverage also contributes to the current cycle length: “That five-year cycle is in part due to just waiting for enough cloud-free pixels to do our work on.” Sometimes, he added, it can take up to three years for a satellite to gather enough suitable data for a particular area. Although the NLCD is based almost entirely off of Landsat imagery, local aerial photography is used to “train” some satellites and to validate data. More commonplace tools are also employed. Although increased update frequency may be years away, Homer said several upgrades will be made to the NLCD in the near future.